I am a bookworm. Of all my hobbies if I have to choose only one, then it would be reading. I read almost anything and everything. When I had to live alone for months together without TV or Internet, one of the main reasons I survived without going mad was books. I actually started reading quite by accident. My brother is also an avid book reader and being 6 years elder to me, he used to read/still reads a lot of books. At around 7 or 8 years of age, having a lot of idle time to kill, I started looking through the pictures of the comics that he had. It was a Little Archie book and I was so engrossed in looking at the pictures that my dad thought that I was reading earnestly and said something on the lines of “Good! You have also started reading. That is a good habit!” Having been thus (falsely) appreciated, I was too embarrassed to admit that I was only picture-gazing (Cmon! I was only a small kid!). But I felt a little guilty and so thought that I might as well read the book (See? I was a good kid.). And thus started my reading odyssey and from then on there was no turning back (the pages), so as to speak! Aside my school library, the first library I was a member of was Rajeshwari Lending Library on Kutcheri Road, Chennai. Later on I joined the Eashwari Lending Library in Gopalapuram – a small hole in the wall place, which has grown into quite a large franchise now! Every Saturday used to be ‘Library Visit Day’ and was eagerly looked forward to. If for some reason the trip got cancelled, I used to be terribly upset. After regularly blowing away a huge chunk of money on buying books, the husband and I decided to go frugal and enrolled at the Public Library here. So on every trip I make sure to pick up an interesting cookbook. 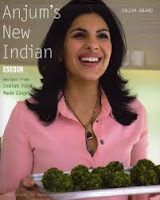 One such book, I picked up was Anjum's New Indian, by the BBC celebrity chef Anjum Anand. I have not seen any of her shows so I wasn't sure about trying out her recipes but I did anyway. I must say that all turned out to be yummy! Although I did increase the heat quotient significantly as her chilli quantities seemed rather tame-more suited for the "firang" tongue! The book is organised into sections for Light Meals & Snacks, Seafood, Chicken, Meat, Vegetables, Beans & Lentils , Rice & Bread, Raitas a& Chutneys and Desserts. So far I've only tried out some chicken recipes (Sorry NS!) including Punjabi Chicken Curry, Black Maharashtrian Style Chicken, The Raj's Chicken Cutlet, Punjabi Chicken Curry, Goan Chicken and Potato Stew and Chicken with Pickling Spices but I soon intend to try out a few dishes from the other categories too. Even with all the lovely cooking blogs that one can find at the touch of a button these days, I still enjoy cookbooks. I really like going through the list of ingredients and ticking them off in my mind and comparing the processes involved. But most of all - here I touch base with some primal, subconscious urge - I absolutely adore gawking at the pictures! And if they come accompanied with interesting stories or anecdotes, what's not to like!? Beautifully illustrated cookbooks are such a joy to behold! And therefore, this Wednesday's Wishlist Item is Cookbooks! Nice! :). It will be blasphemy if I utter this, but chicken dishes do look sooo alluring! Crispy, juicy and roasted with so many spices and flavors, their pictures are quite tempting ;). I'll try to find her book here.... of course, to try the veggie options! I again have to say "same pinch"! But my dad frowned upon comics - except for Tinkle and Panchatantra, which I loved. I thought Enid Blyton was a guy too! I found it very hard to reconcile to the fact that she was a woman :). I was also made to read P.G. Wodehouse and some heavy classics when I was in my adolescent and teen years - thanks to him, I love classics and aspire to finish all (most) of them (the well known ones) within my lifetime! The Hunchback of Notredame is one of my faves. Ya Wodehouse too! How did I miss him! You know, I don't think anyone has ever gifted me any books, let alone cook books! Maybe I don't come across as the "intellectual" type or something! I will try Anjum recipes Soon.Thanks for sharing. @Christy: Great! looking forward to see some exciting recipes on your blog pretty soon then!